Pastrnak extension with Bruins is complete. 6 years, $40 million. $6.6667 aav. CUE THE DUCK BOATS! THE STANLEY CUP IS BACK ON! Obviously this is huge news, the Bruins are getting back one of their best players who is coming off a season where he was 10th in the league in goals. The 21 year old got a nice contract from the B’s, however, I think this is a giant win for the team and Don Sweeney. David Pastrnak was hoping to get paid similar to what that idiot Peter Chiarelli gave Leon Draisaitl who is also 21 and put up similar numbers to Pasta. Leon Draisaitl was just rewarded with a 8 year $68 million deal ($8.5 million a year) contract which is really what Pasta’s team was waiting for. The reports were that in the beginning of the summer, the Bruin’s offered Pasta 6 Years, $36 Million as a starting point. Obviously that number is too low, but that is what you are supposed to do while negotiating. The team offer is too low, the players counter offer is too high, and they meet somewhere in the middle. However, Pasta’s team got the teams offer of $6 Mil per season, and just stopped communication with the B’s. This stayed the same until the Draisaitl contract dropped. But even then, it seemed like communications were not great. Talks still ongoing between JP Barry & Don Sweeney on a Pastrnak deal w/a variety of year terms in discussion. Barry: "No breakthrough yet"
There were even rumors that Pasta would be fine with joining the KHL in Russia if a contract agreement was not made. 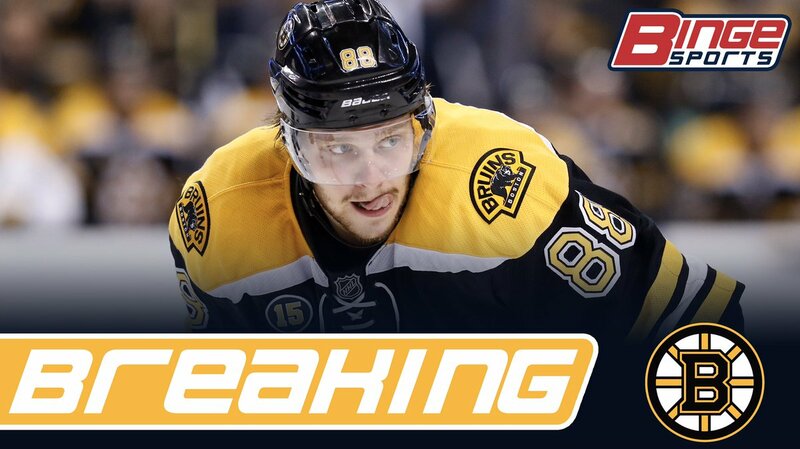 Rumblings have indicated that Pastrnak could play in the KHL this season. Has multiple offers. However, with training camp starting today, both sides knew that something had to happen. I can’t tell you how pumped I am that not only Pastrnak is back with the B’s and will be here for the kickoff of the preseason, but they also locked him in at a deal well below what Pasta was looking for. This is without a doubt a HUGE win for Don Sweeney, who really has not won a contract dispute like this before. Brad Marchand easily resigned with the team on a real team friendly deal and Dougie Hamilton was traded after not coming to an agreement. I am just beyond happy that this one was not only dealt with, but a win for the team. Don Sweeney has preached ever since he was named GM that he wanted to draft and develop and he was sick of seeing the Bruins’ talent spread all over the league. Keeping Pastrnak was the next big step in that process. The team has seemed to have drafted well the last couple of seasons, and it is huge that all these young players can see that if you produce here, you can get paid. Now lets get this season going! This deserves a celebration! Previous Should The Patriots Consider Trading Dion Lewis?